When Evgeni Malkin went down with a long term injury in the midst of a playoff chase, the talking heads wondered how Pittsburgh would make the postseason without their star center. Fast forward four games, and the rest of the Eastern Conference is likely wondering how dangerous the Penguins could be if/when they're able to insert Malkin back into the lineup. The Penguins absolutely dominated the Flyers, holding Philadelphia to 17 shots on goal, and the Penguins extended their win streak to 5 games as they beat Philly 4-1. Sidney Crosby extended his points streak to 11 games with a 2nd period assist, tying his season-long set earlier in the calendar year. The win momentarily moves the Penguins past the New York Islanders for 3rd place in the Metropolitan Division, pending the Isles' outcome against the Dallas Stars later tonight, and the loss keep the Flyers on the outside looking in. Philadelphia had a great chance in the opening minute with a 3-on-1, but Brayden Schenn put the shot just wide of the net as Macr-Andre Fleury was sliding cross crease to take away the net. Philly got an early power play when Brian Dumoulin tripped Wayne Simmonds, but despite a couple chances the Flyers weren't able to beat Fleury to take advantage of the opportunity. Philadelphia would get another odd man rush midway through the period after Kris Letang turned it over on the blueline, but they couldn't get a good scoring chance off the 2-on-1. The Penguins would get a power play of their own when Schenn was called for a roughing penalty against Chris Kunitz, but the Flyers penalty kill did a good job of preventing Pittsburgh from getting set up in the offensive zone and denied the Pens from getting the opening goal. Like any game between the Flyers and the Penguins, things started getting chippy, and the Penguins would get another power play with over 4 minutes left in the period when Radko Gudas caught Tom Kuhnhackl with a high stick. 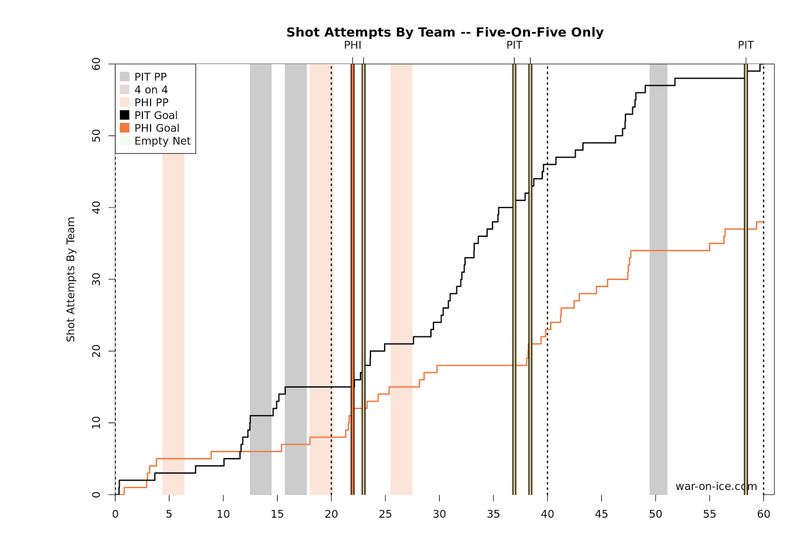 but they would again have a difficult time getting going as the Flyers did a great job of clogging up the neutral zone. It wouldn't take long after the Pittsburgh opportunity expired for another penalty to be called, but this time it was the Penguins who would take it as Bryan Rust was called for tripping Gudas. Carl Hagelin had one of the best opportunities of the 1st period at the start of the penalty kill as he used his speed to pull away for a breakaway, but he wasn't able to wrist his shot past Steve Mason. The period would end still tied 0-0, and the Flyers would have another 3 seconds left on their power play after the first intermission. The Flyers would finally open the scoring minutes into the 2nd period when Gudas wrists a shot from the right point that deflected off Letang and past Fleury. The lead wouldn't last for long though. Eric Fehr drew a tripping penalty, and before the Flyers could touch the puck to begin the Pittsburgh power play Nick Bonino found Trevor Daley backdoor to tie the game 1-1. It seemed like the game was ready to bust wide open, but it wouldn't end up being the case. Minutes later, Claude Giroux would draw an interference penalty on Oskar Sundqvist to give the Flyers another power play. For the 3rd time on the game the Penguins were able to kill of the Flyers' man advantage, and played continued at even strength tied 1-1. 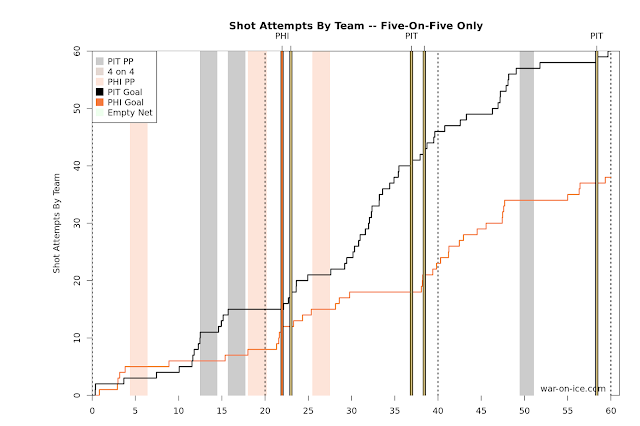 The Penguins dominated possession in the 2nd period, and they would be rewarded for their efforts late in the period. Carl Hagelin broke the tie with 3 minutes left in the 2nd period, as his slap shot beat Mason. Phil Kessel caused a turnover along the right boards to start the play, and Bonino was able to grab the loose puck and feed Hagelin driving the center lane. Kunitz would then make it 3-1 Pittsburgh 1:29 later after his slap shot went wide of the net, ricocheted off the boards, and hit off Mason and into the goal. The two quick goals allowed the Pens to take a 3-1 lead into the locker room for the second intermission, and it was a back-breaking series of events for the Flyers right before the 2nd period ended. Philly would look to come out and start the 3rd period quickly, but it was the Penguins who had the best chance early as Bryan Rust was all alone on a breakaway minutes into the period, but Mason made the save on the wrister and sent the puck into the corner. The Penguins would do a good job of prevented the Flyers from getting much going offensively, and they were able to draw a penalty midway through the 3rd when Michael Raffl cross checked Letang behind the net in the Pittsburgh zone. A goal would effectively put the game away, but despite Pittsburgh's best efforts they weren't able to extend their lead to 3. Regardless, the Pens continued to smother the Philadelphia offense. In a particularly inept display of officiating at the end of the game, the referees initially ruled it a goal on the ice as Letang appeared to deflect a Kunitz pass into the empty net off the shaft of his stick. They then announced that Letang kicked the puck into the net before going to review the play. After the review, they announced that it was a distinct kicking motion and the goal didn't count before yet again reversing themselves and awarding Letang the goal. Pittsburgh and Philadelphia have been two of the best possession teams in the league recently, but that didn't stop the Pens from absolutely crushing the Flyers with an obscene score-adjusted 65.6 CF%. The Penguins will look to further extend their winning streak when they travel to Washington tomorrow to play the Capitals. It'll likely be Matt Murray in net tomorrow to face the Capitals for the 2nd time in a row, and Pittsburgh will be hoping for a better outcome than the last game, where they controlled the play in the early going but tired out in the 3rd period to fall to the Caps 3-2.